The property is situated on corner which has a trapezuim form. The building view is oriented entirely to the formed open air garden. The principal of the symmetry is based on the constructive solution of the air space. The building has five floors ( level +0.00,+3.44,+6.28,+9.12,+11.96), one roof floor (+14.80) and two underground floor (level -3.44 and – 6.24). It is located in the corner of the two streets "Blaga Dimitrova" and "Ündola", in a residential district "Reduta". The residential entrance is from the side of the street "Blaga Dimitrova". 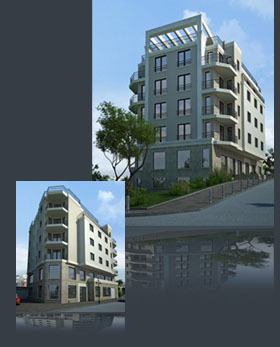 • will include residential and office areas with GFA of 1925 sq.m. will include 9 two-roomed apartments, 8 three-rooms apartments, 26 parking lots (20 parking lots are underground), three offices and one shop. • The property will be with luxury common areas, PVC joinery with triple glass package, with a luxury elevator, apartament's woodcoverd doors with the high security locks.